Staying active, being healthy and working hard are all things we believe are beautiful! We dedicated last month to fitness as we know March can be the breaking point for many people… It’s still cold out, the days are not much longer than they used to be and we are all itching for warmer weather. Sometimes all it takes is a little inspiration to get us back on track so that is exactly what we aimed to provide! 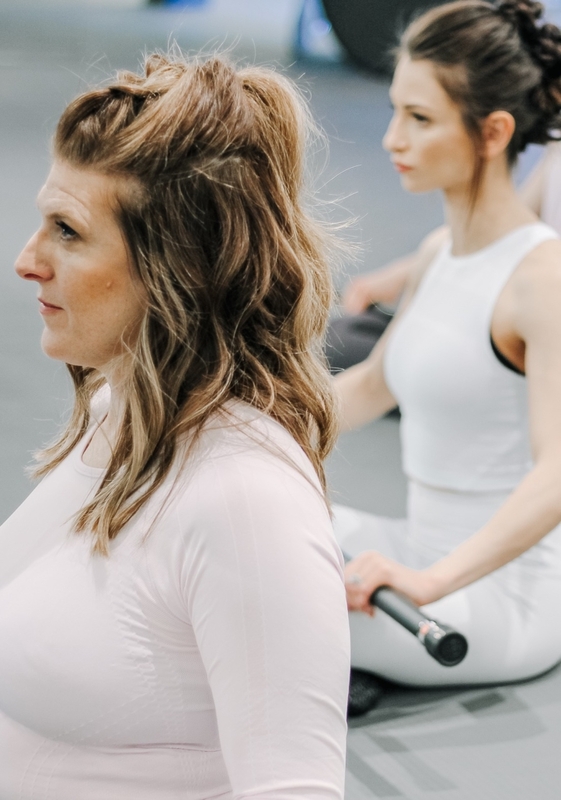 By partnering with two local businesses in Omaha and Elkhorn, we were able to showcase different types of workouts and the amazing ladies who do them. Sweating, working hard and staying active isn’t always pretty but what makes us strong and powerful also makes us beautiful! 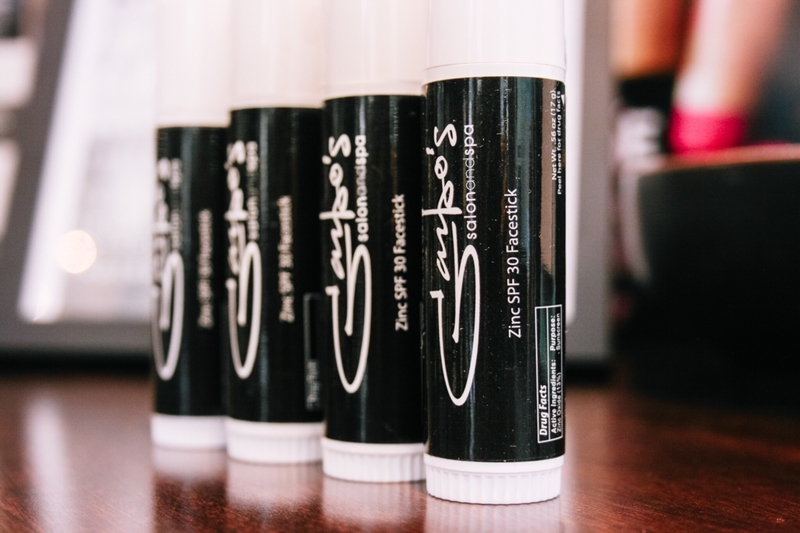 Read below for a quick recap of the businesses we partnered with, the looks we showcased and the products we recommend when you are busy staying active! Our first partnership of the month was with Barre Code and Athleta at Village Pointe in West Omaha. If you have never done a Barre class before you have never felt your legs and arms burn like this… The workouts consist of cardio and strength training but the overall emphasis is on positivity and female empowerment. When styling this shoot, we went with styles that could be easily transitioned from work to workout. Many of the classes Barre Code offers are over the lunchtime hour so busy professionals are popping in during their lunch break. With no time to fix their hair and makeup after the workout, we made sure our looks could easily transition from one activity to the next. 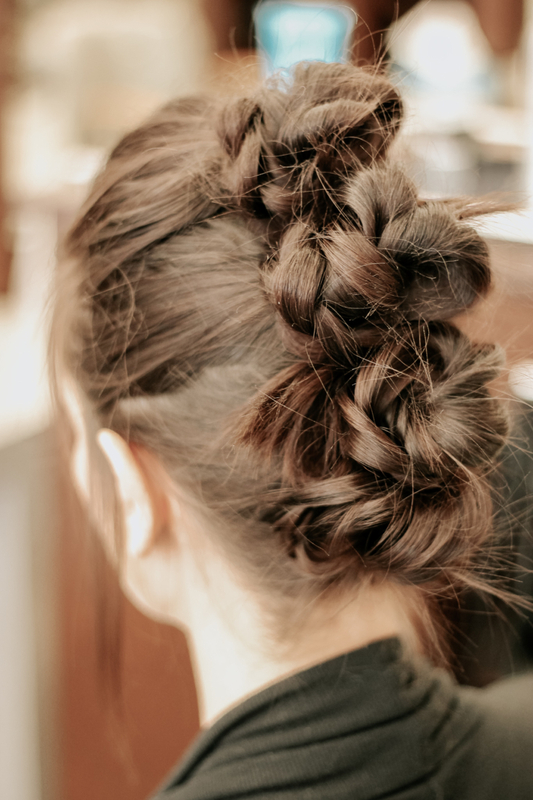 The hairstyles we went for our Barre Code athletes can easily be replicated at home. 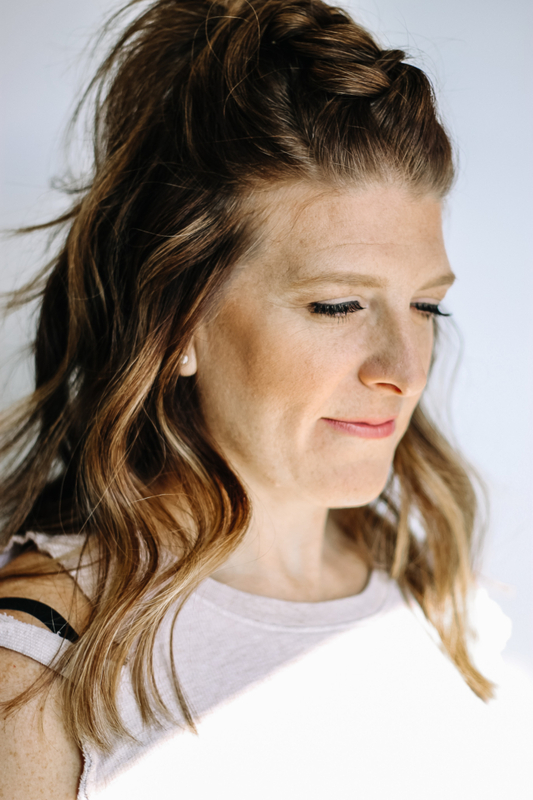 The idea behind these looks was to keep the hair out of the face but provide a style that was easy enough to do at home and cute enough to wear to work (or anywhere else you are heading to that day!). 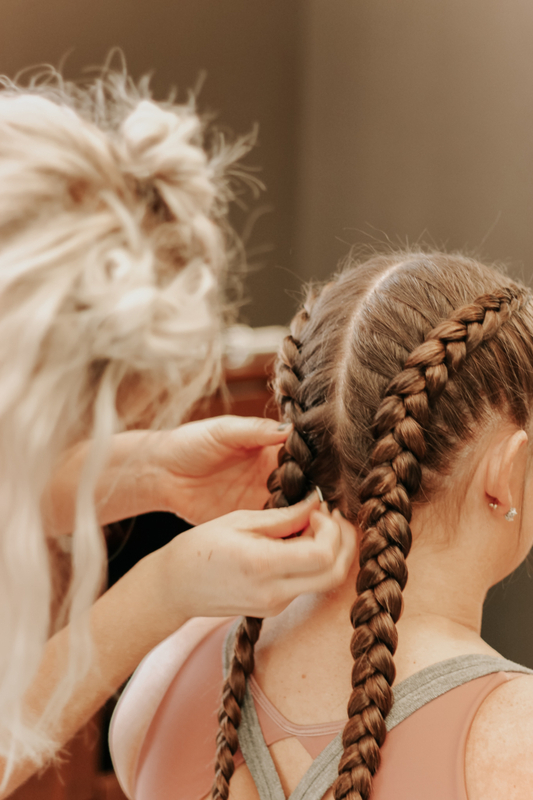 The double dutch braid in the first picture can be accomplished by crossing each of the three strands UNDER one another. Just think about how you normal braid your hair and pull the strands the opposite way. By doing this you are taking a normal braid style and mixing it up just a tad. And by wrapping a small strand of hair around your elastic you take the look to another level! The hairstyle you see in the first picture above may seem complicated but it is actually four individual ponies braided and then fashioned into buns. 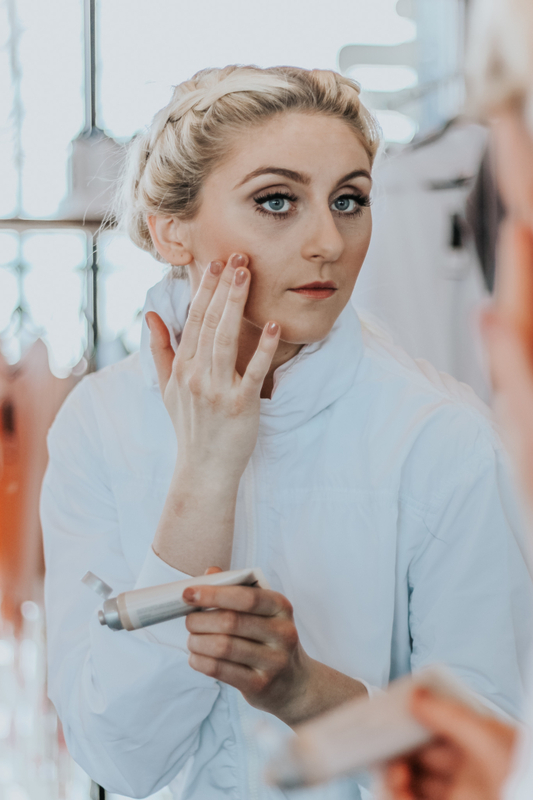 Not only is this look extremely easy but it will also keep all those fly-away hairs in place as you transition from one barre move to the next. As for products used to maintain these styles, Garbo’s Freshen Up Dry Shampoo is the answer. Throw the small can in your gym back and give your hair and scalp a quick spritz after class. The dry shampoo will absorb the oils while re-securing your hair back in place. 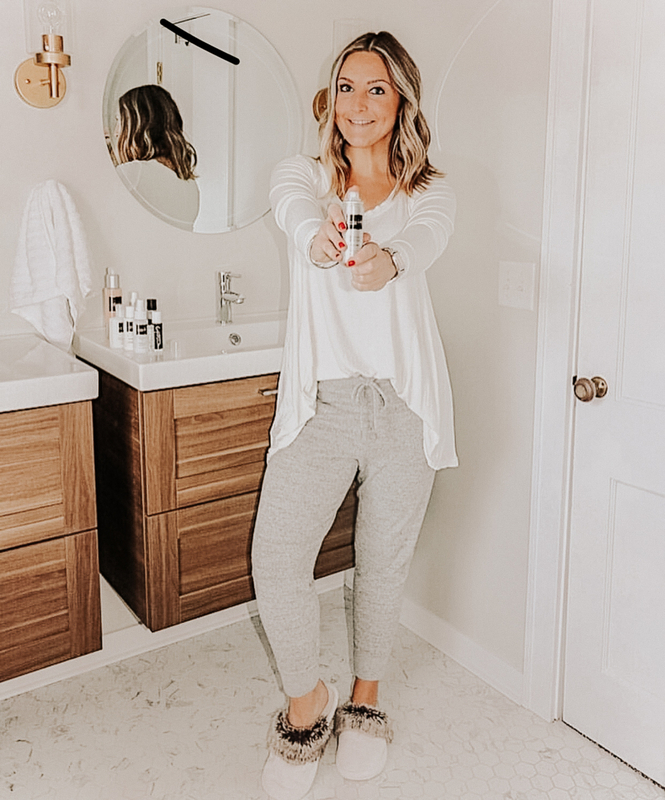 The best part is this dry shampoo smells amazing so you don’t have to worry about any bad smells lingering once you get back to the office! 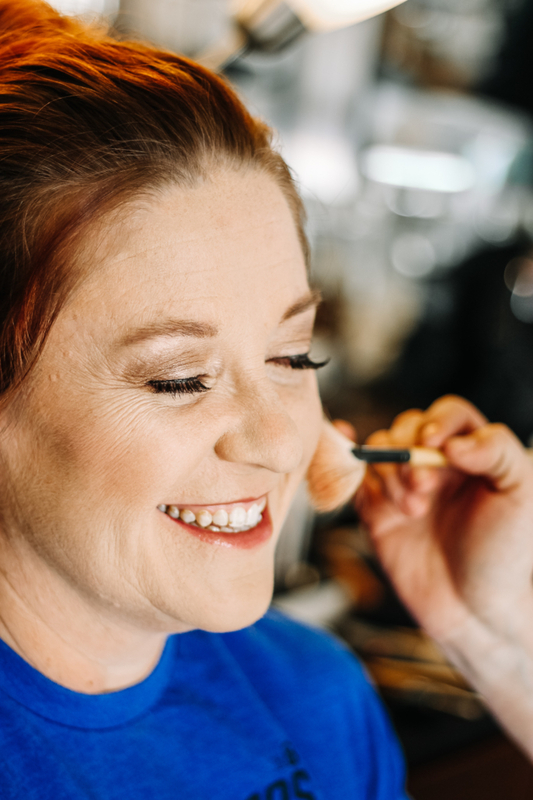 Makeup by Ashley Beutler, Garbo's Salon and Spa - Village Pointe. To achieve the makeup looks for this shoot, we used Aveda’s Inner Light Mineral Tinted Moisture. This light foundation will both protect the skin and hide your imperfections all while feeling light and airy. 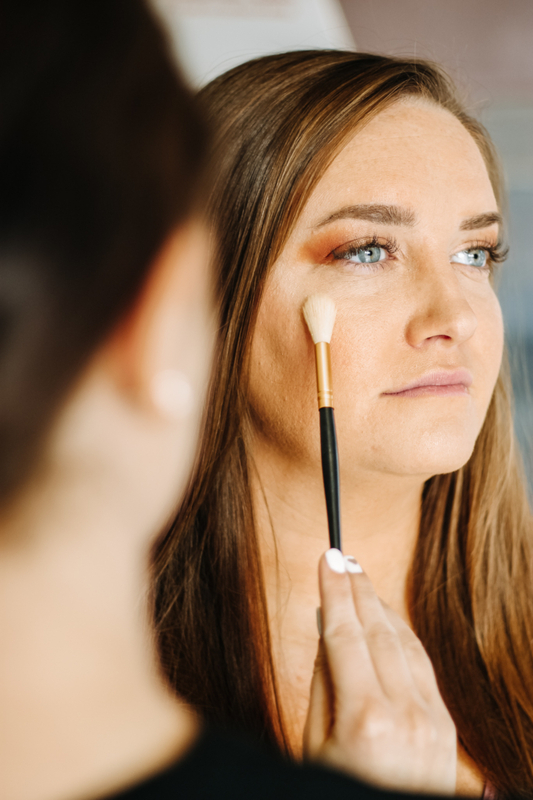 By using products that were light and wouldn’t clog the pores, we ensured our models looked and felt beautiful while working out. The other local business we partnered with this month was CrossFit Elkhorn. A CrossFit class is a bit different than a barre class. Focusing on power, speed, and athleticism, CrossFit is a much heavier workout. CrossFit Elkhorn (CFE) is located a bit further west than Village Pointe – on 204th street in Elkhorn, NE. With a membership of over 200 members, this gym is truly making its mark on the small town of Elkhorn. With an all-inclusive atmosphere, CFE stands out among other CrossFit gyms in town. Everyone is an athlete at CFE – no matter where you are on your fitness journey the trainers will help you reach your goals! Although CrossFit does differ from a Barre workout our approach to the hair and makeup for this shoot didn’t change too much. Keeping the hair out of the face was priority number one. 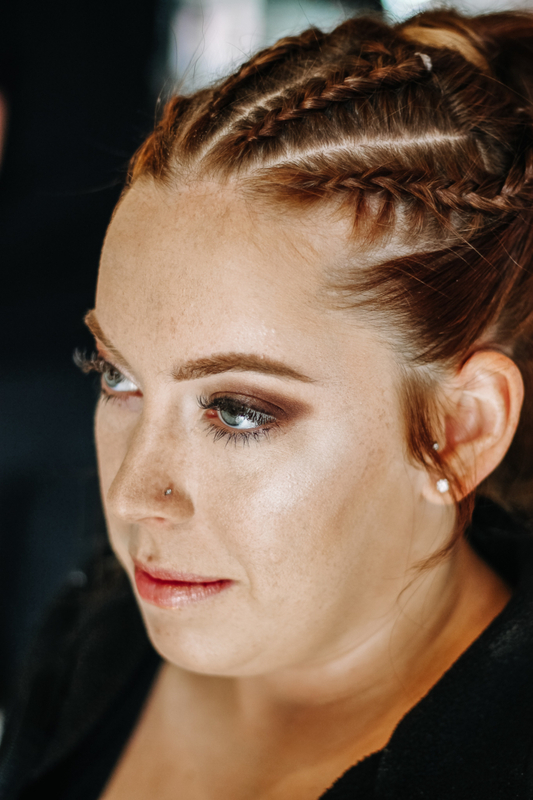 Amber Klebba (@amberklebbapro) styled the first look by adding braids to the typical ponytail. The tension in the braids along the hairline keeps the baby hairs, bangs and layers locked into place throughout your workout! Another look we styled originated from a messy bun. Grabbing your hair and throwing it on the top of your head may seem like the best workout style but unfortunately, buns easily fall out. 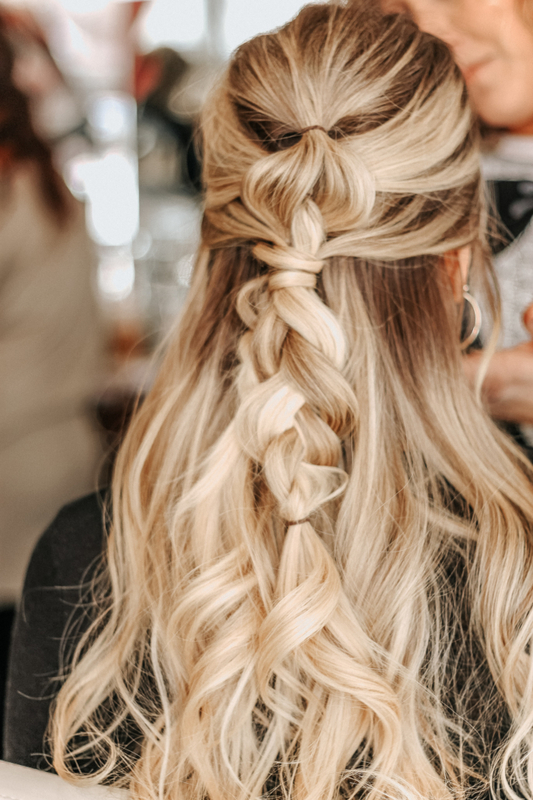 Add in a few powerful CrossFit moves and your once perfect top-knot is now resting on your shoulders… Therefore, we added in an additional elastic, a few bobby pins and a quick spritz of hair spray to keep this one in place! 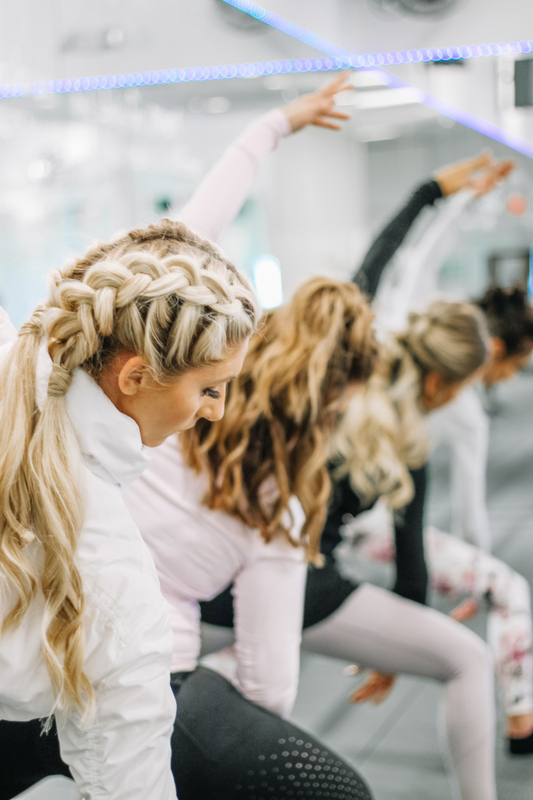 The next look we styled also included braids as they truly are a great way to keep your hair out of your face while you workout! We added two buns to this version to make it stand out a bit! Our goal this month was to inspire you to keep pushing through. Whether you gained inspiration from the strong women at Barre Code or the powerful women at CrossFit Elkhorn, we just hope these styles were enough to get you back on your feet! 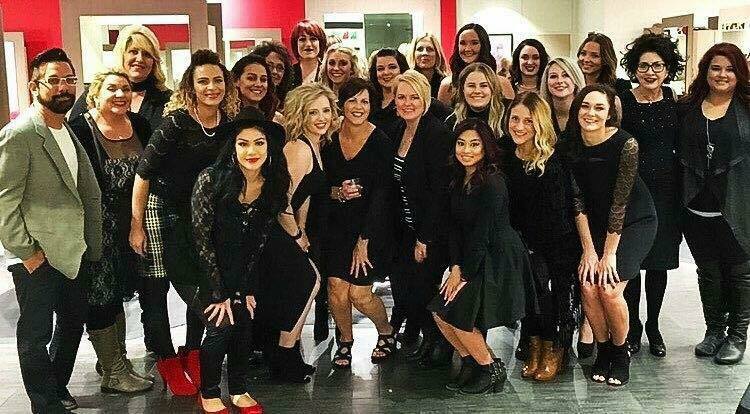 A HUGE thank you to those who helped make this collaboration possible – the hairstylists and makeup artists who volunteered their time, Bonnie Eisenhart, her beautiful Barre Code Team, Justin and Lindsey Carraher and their amazing CrossFit Elkhorn Team! Thanks so much for reading and make sure you stay tuned as we are working on a few Springtime posts that I’m sure you’ll love! 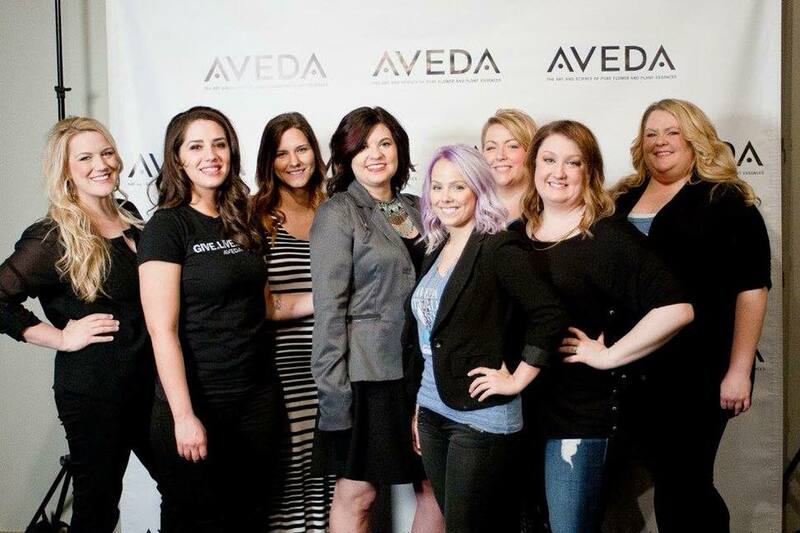 For the past three years we have come together to celebrate the salon’s top performers. This year’s event took place on Sunday evening (after our amazing cutting class with Geno Chapman) at Herbe Sainte in Aksarben Village. 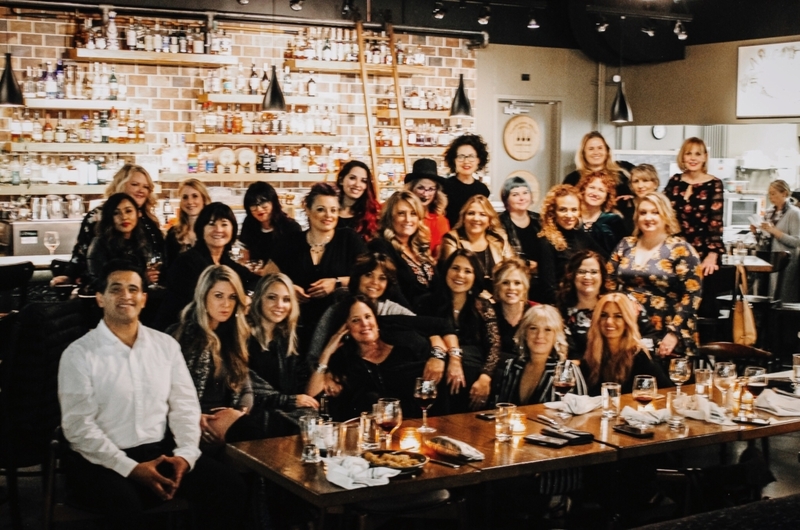 We invited the thirty eight top performers to enjoy a tasty, New Orleans inspired dinner and be celebrated for the hard work and dedication they demonstrated throughout the previous year. Before the celebrations could commence we were all crossing our fingers the event would actually happen… The weather in Nebraska is always crazy but no one expected to get a snowstorm in the middle of October! Thousands of people all over town lost power but thankfully our gracious hosts at Herbe Sainte were not affected. They were busy prepping for our large party to take over their adorable restaurant that evening! Once we had all made it safely to the restaurant we grouped together for a photo (pictured above) and settled in so our keynote speaker could take the stage. 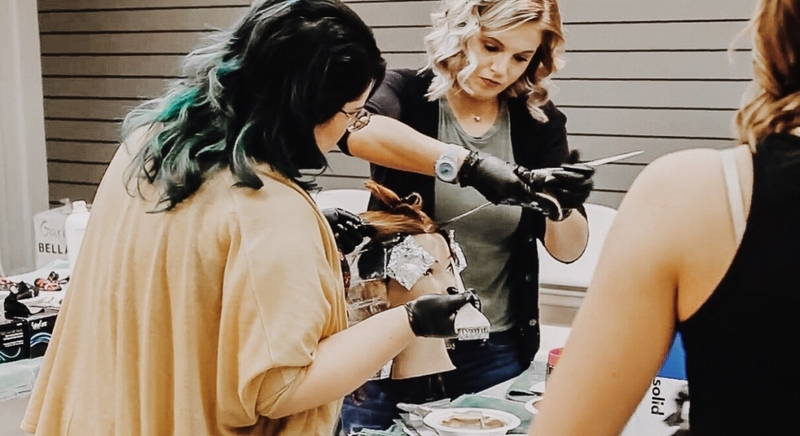 If you follow our instagram page (@garbossalonandspa) you’ll know we had Geno Chapman in our Academy earlier on Sunday to take us through an advanced cutting class. His speech that evening was as inspiring and informational as his class earlier that day! Many of our Top Performers have been in the business for many years so it filled us with energy to hear Geno talk us through how he still finds inspiration and excitement in his work. Next, our fearless leader (and owner), Darcy Michalek, along with our Manager, Sherri Mahoney, presented each of the present award winners their Top Performer awards. The small trophies were accompanied by a little highlight of each person – a funny story or sweet memory that made us all smile. We finished the evening by enjoying the time we had to spend together and celebrate each other. 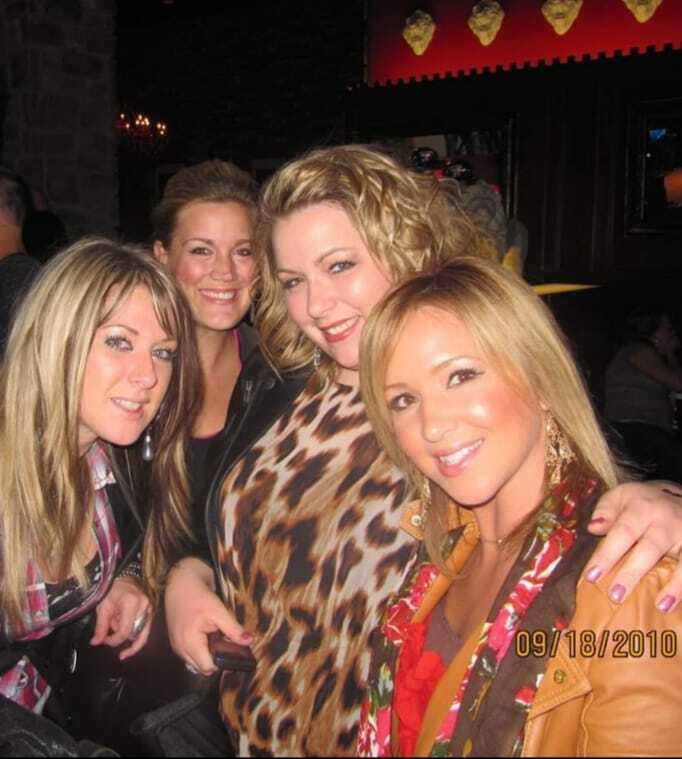 We only do this one a year so we relish the opportunity we are given to chit chat and catch up with our fellow team members outside of the salon. Each and every person who works at Garbo’s deserves to be recognized for their hard work and dedication to the organization but this small group of individuals deserve an extra little thank you for going above and beyond. Thank you very much! Now, go celebrate, you deserve it! Over the past few months the team and I have been working to re-vamp our Instagram account. 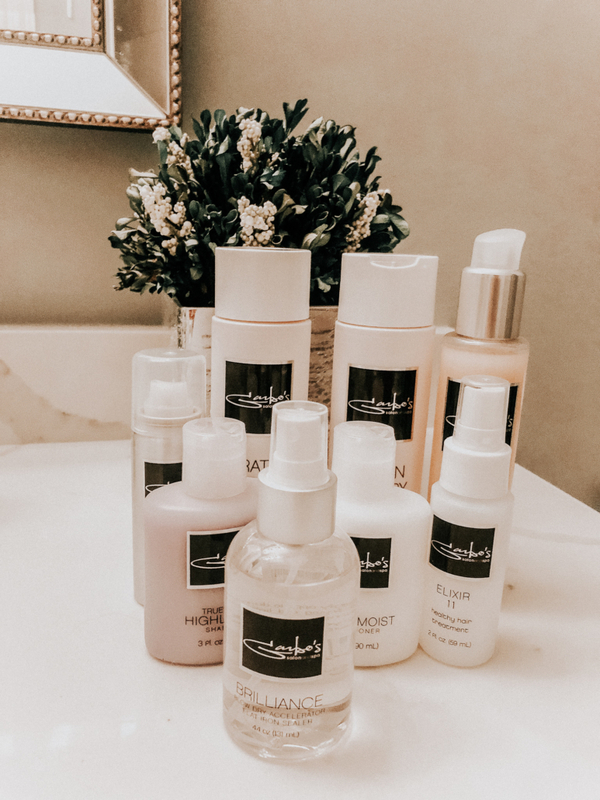 Previously, each one of our four locations (Midtown, Oak View Mall, Regency, Village Pointe) had their own separate Instagram account sharing the work of the stylists at that location. While we loved giving a voice to each specific location we really wanted to focus in on what Garbo’s as a whole had to say. 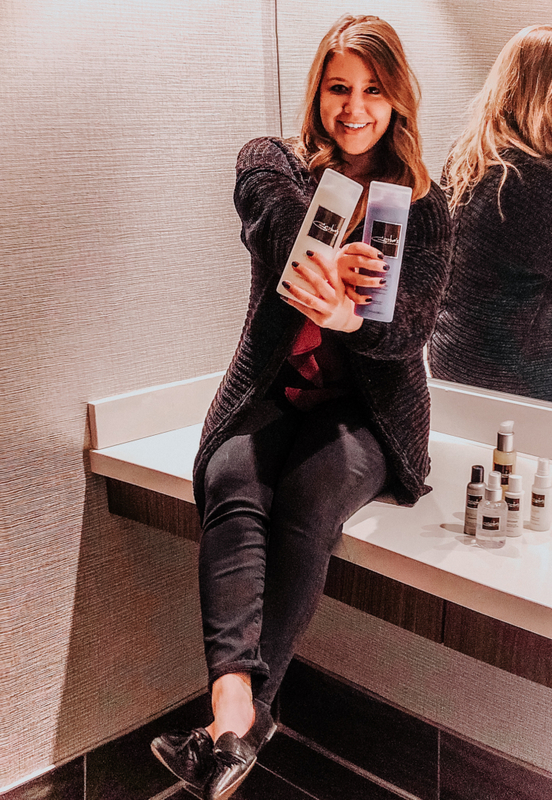 No matter what location you visit your experience shouldn’t change – our mission and our values are implemented and demonstrated daily in each Garbo’s salon. That same mission and those same values should also be present online. That is why we decided to combine our four previous accounts into one thus giving a unified voice to the Garbo’s brand. That is a great question! 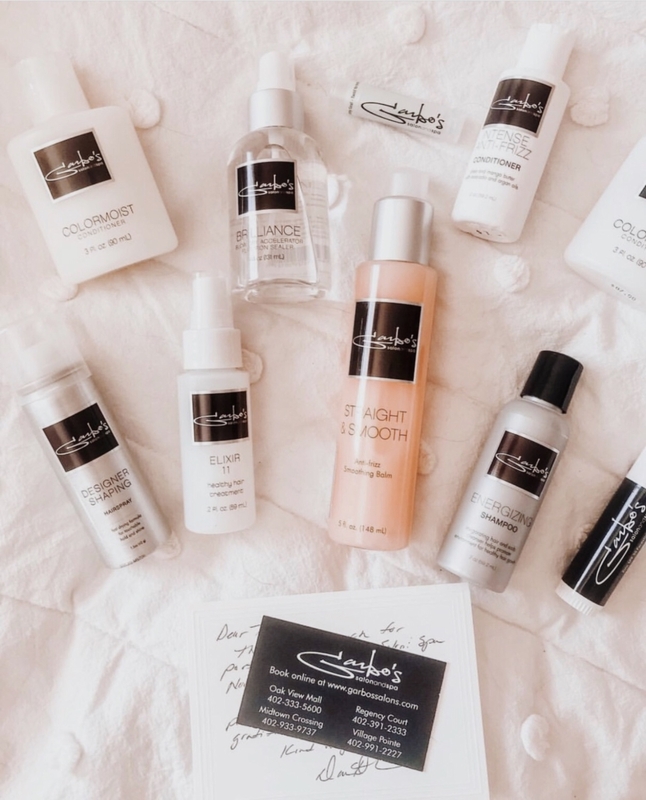 This new account will be your go-to resource for all things hair and beauty. 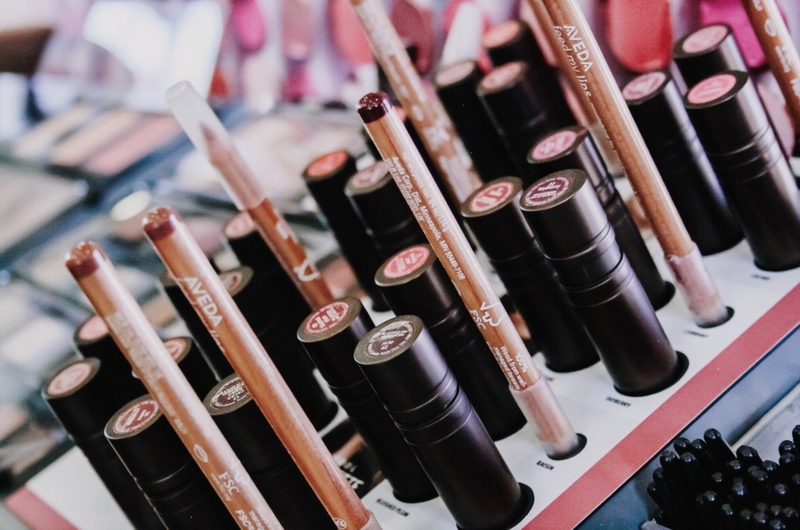 We are dedicated to providing our followers with quick and easy tips you can learn while scrolling your feed, hair and beauty inspiration, product recommendations, behind the scenes shots and more! This account was built for you. 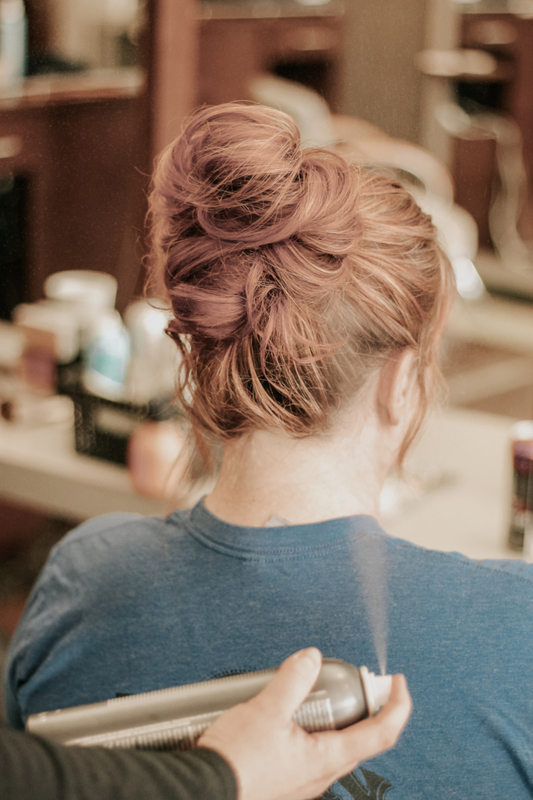 We want to be more than your neighborhood salon, we want to be your guide in this amazing beauty space that constantly changes with new looks, ideas and trends. We are here to help! Instagram not your thing? That’s okay! Subscribe to our newsletter to stay up to date on whats going on and to help us build a community of talented and inspiring people! https://garbossalons.com/wp-content/uploads/2018/10/Photo-Sep-17-7-29-44-PM-1-1-e1538665646474.jpg 1333 1893 Maddie https://www.garbossalons.com/wp-content/uploads/2016/10/Garbo_logo-300x98.png Maddie2018-10-03 16:00:072018-10-04 10:08:17Our New Instagram Account is LIVE! 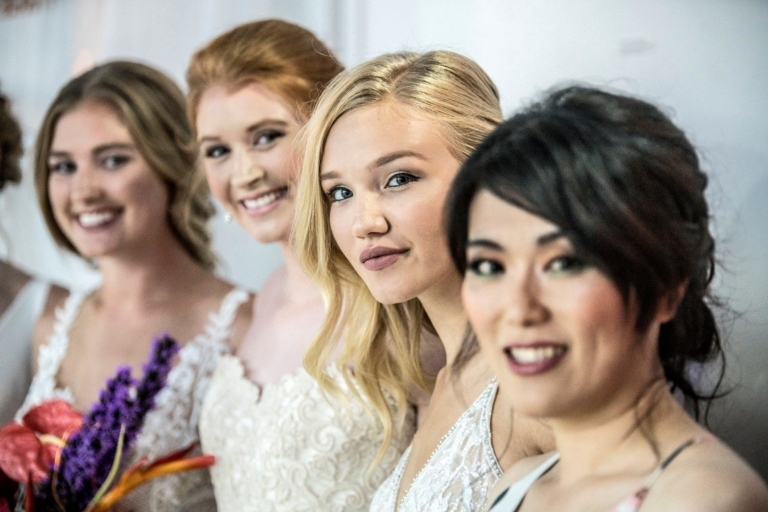 This week was a special week for us – we had the opportunity to join Omaha Fashion Week in its first bridal themed showcase – The Wedding Salon! As the summer winds down (I can’t believe Labor Day is almost here!) 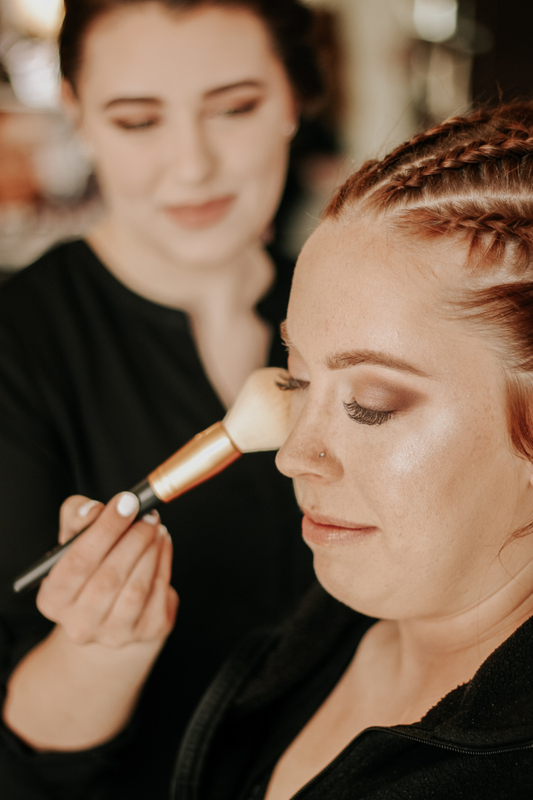 and wedding season comes to a close, we were excited to show those attending the event the different hair and makeup styles we were able to create. 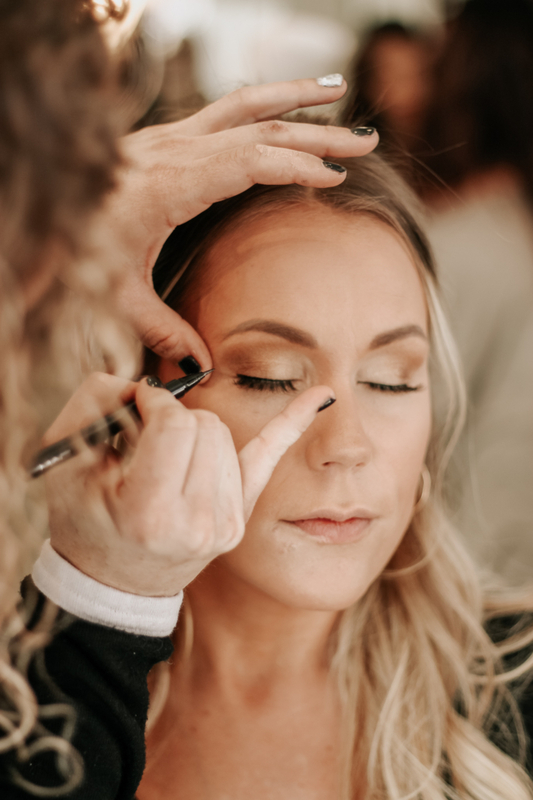 As the night’s exclusive makeup and hair vendor, we had the chance to let our creative juices flow and come up with the styles that best suited both the model and the dress they would adorn later that evening. 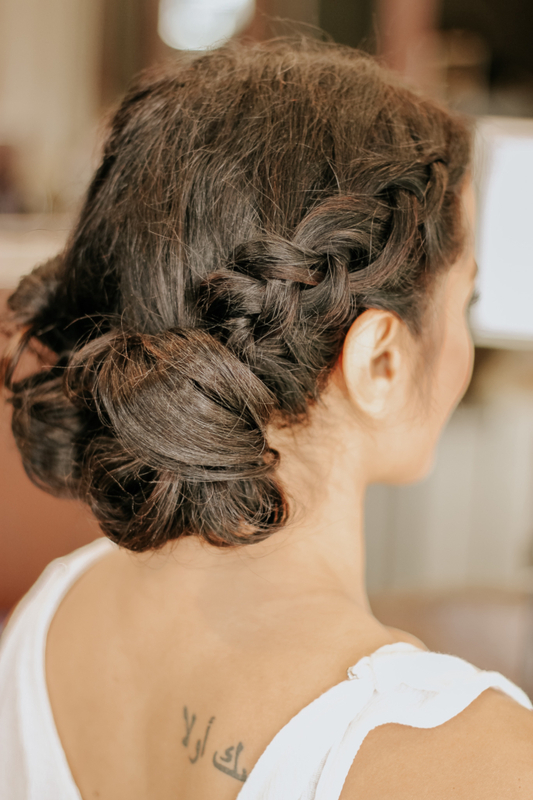 From up-do’s to braids to large back-combed styles, we really had fun creating each and every look! 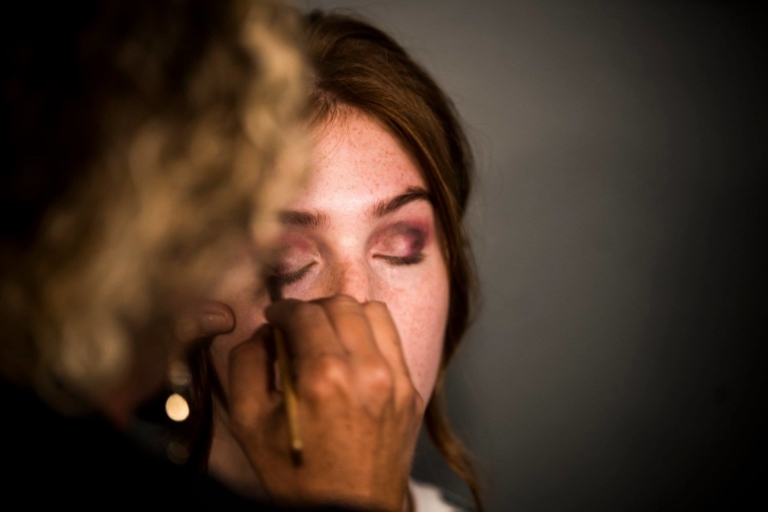 Just like a typical wedding day it was both exciting and stressful… doing hair and makeup for 70+ women is no easy task! With only a few hours to make visions into reality, the floor was buzzing with activity. As the final bobby pins were placed and the clouds of hairspray died down, the final products began to emerge… and let me tell you, everyone looked stunning! 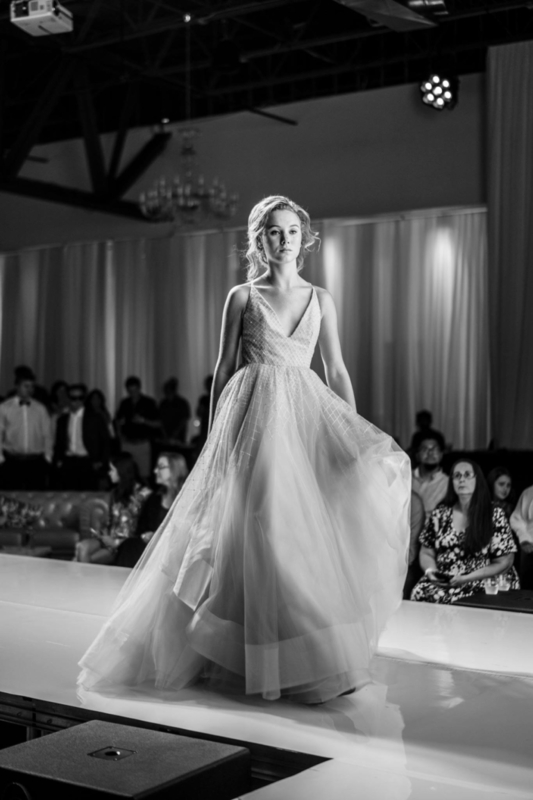 It was hard to believe the women in the chairs were not getting ready to walk down the aisle but instead the runway! Weddings hold a special place in our hearts here at Garbo’s. 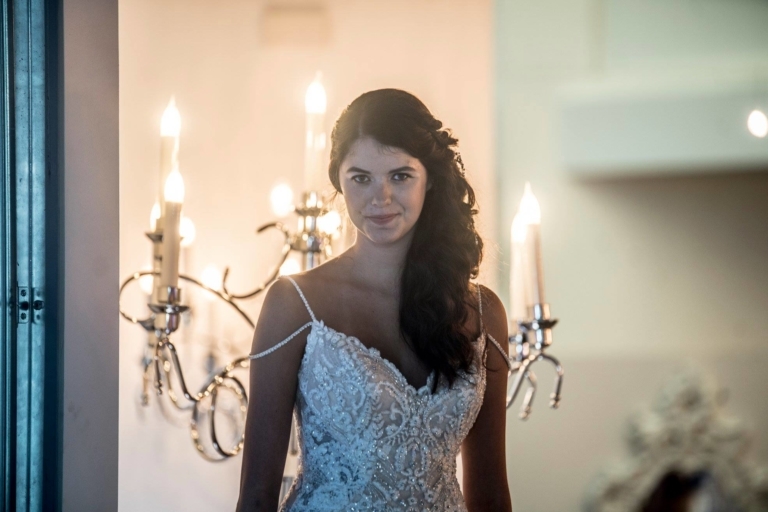 As a recent bride myself, I know how much trust our clients put in their stylists when they ask them to be a part of their special day. So being able to showcase our talented teams’ abilities to a room full of people was a treat and we were delighted to be a part of Omaha Fashion week again this year! If you or any of your friends are getting married soon please consider Garbo’s when looking for a team to take care of you and your girls on your big day. Drop us a line or send us a note (link below) to find out how we can help make your day truly special!